County Donegal, covering almost 5,000 square kilometers or nearly 2,000 square miles, is one of the largest counties in Ireland (the 4th largest) and sits up on the north west coast of Ireland in the province of Ulster (Ireland has four provinces: Ulster; Connaght; Leinster; Munster). 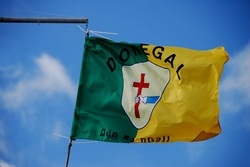 Donegal is joined to the 26 counties of Ireland (the Republic of Ireland) by a thin strip of land in County Leitrim. It borders three of the six counties of Northern Ireland (which are under British rule) and is the largest of the counties of the province of Ulster. Donegal has the highest seacliffs in Europe at Sliabh Liag (Slieve League) and the second longest river in Ireland, the Erne at Ballyshannon. The highest mountain in Donegal is Errigal which dominates the scenery from many areas of Donegal.